Darina Allen is surely one of the most celebrated Irish cooks of our time. If she isn’t then it’s probable that whoever you might consider worthy of that accolade also has the name of Allen: it’s quite a dynasty. There is no doubt though that Darina must win the contest of quickest smile and she has been described as the Irish Delia Smith. Irish Traditional Cooking is a lovely book which Nigel Slater says “…is the equivalent of being given a big hug.” It might sound a strange thing to say of a cookbook but turn a few pages and you will feel a real glow as you imagine these comforting dishes. It’s not only this humble writer that has appreciated its quality. Irish Traditional Cooking has won the acclaimed Langhe Ceretto-SEI prize. This is a marvellous collection of over 300 recipes. The charm of it is that we hear a little of the history of many of these dishes and learn something of the people that have passed these recipes on to Darina. Food is, after all, a catalyst for memories of special events and loved ones. Irish Traditional Cooking has contributions from frayed and ancient cookbooks as well as friends, family and professionals. These recipes are a treat. The ingredients are simple but the dishes are flavourful, comforting, not over-taxing to prepare. Traditional recipes are sure to be good as they have already withstood the test of time. There is even a recipe for tripe that sounds tempting and I didn’t think you would ever hear me say that! I will, over the next weeks, be grazing my way through this book. I’ll probably start with Beef and Guinness Stew or will it be Ballymaloe Spiced Beef? No, no, I’ll go with the Pot Roasted Pork Steaks. It’s not that easy to pick favourites. Buy the book and you’ll work your way from cover to cover just as I intend to. Irish Traditional Cooking has all the usual suspects, those dishes you would have heard of, but there are so many more that have obviously been regulars on Irish tables for years. Plum Cakes, home-made cheeses, Goose Pudding and Irish Stew Pie are just some of the dishes that are a bit different from the potatoes that you were no doubt expecting. 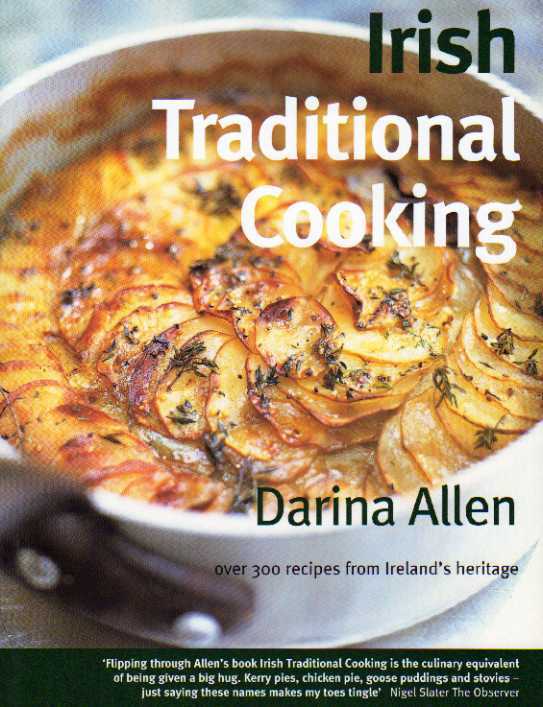 Darina has penned what is probably the definitive Irish Cookbook. Anyone who recognises the value of traditional cooking will enjoy this. This is home cooking at its best.